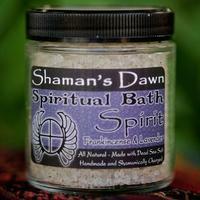 Shamans Dawn Bath Salts are an excellent tool for relaxation, healing, and spiritual practices. 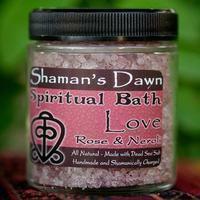 All bath salts are made with dead sea salt which is highly prized for its therapeutic properties. 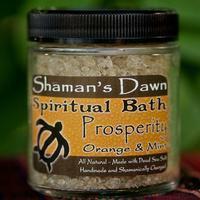 Essential oils and ground botanicals are added which lend their own unique blend of healing properties. 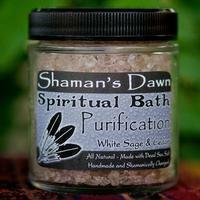 The bath salts are then charged with prayer and ceremony to give them additional spiritual power. 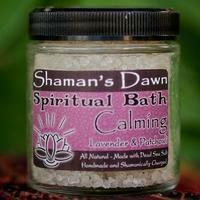 These bath salts are an excellent way to purify or empower yourself before sacred work, as part of meditation or affirmation work, or simply as a way to relax in conjunction with their aromatherapy properties. 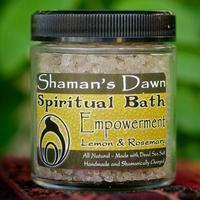 Use For: relaxation, bringing peace of mind, dispersing anxiety, and restful sleep. Use For: waking up your personal power, building confidence, placing you back in touch with what you are passionate about, and waking up your senses. 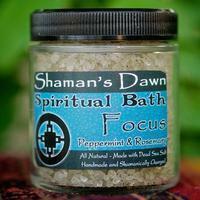 Use For: sharpening your mind, revitalizing energy, increasing memory and cognitive abilities, and dispersing depressive energies. 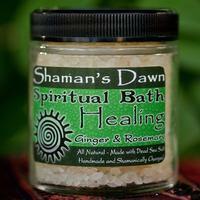 Use For: Assistance in healing of the body and soul, relief of sore muscles, aids poor circulation, to wash away the energies of illness. 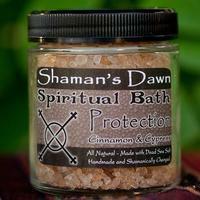 Use For: Aiding in communion with the divine, entering meditative states, waking up intuition, and welcoming in the helping spirits and guides.